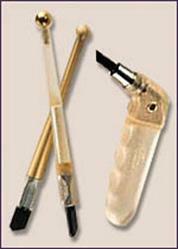 TOYO brand cutters are very popular among stained glass enthusiasts. While we're primarily a Fletcher-Terry shop here at Whittemore-Durgin, we've heard your clamoring for TOYO products, and hope this small offering will satisfy. Or at least stop the clamoring. 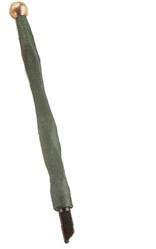 Top quality pencil-grip glass cutters, regular or carbide steel wheels. Made in the U.S.A. Comfortable pencil grip with an oil reservoir. 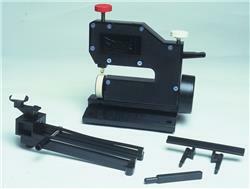 These high quality hand tools feature Fletcher-Terry's Fiberlock(TM) anti-leak fluid dispensing system. It lays down a perfect bead of cutting oil for smooth, precise scores. The Inland ScoreOne Glass Cutter was a very nifty device for cutting glass, but the manufacturer, Inland Crafts, seems to be having trouble making them these days. Nonetheless, we still have some accessories that you lucky ScoreOne owners out there might need from time to time. Items to enhance your glass cutting experience. 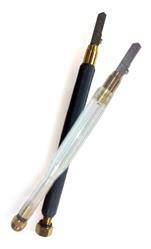 ﻿We know that gripping a pencil-style glass cutter can be hard on the fingers after a while. 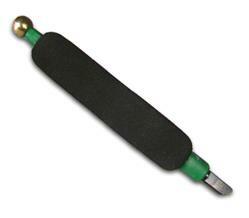 This foam grip eases the strain, allowing you to work comfortably. Installing it on your cutter might be a minor struggle; the larger the cutter the harder it is to install -- much like donning Spanx. However, like Spanx, it's worth the effort. Unlike Spanx, you don't need to remove it at the end of the day. Made in the USA.